We should first have a brief overview of basics of the game before we study baccarat strategies. The basic objective in this game is to make combination of two or three cards which add up and make nine. The player who is closest to nine in any deal wins. The cards have values which are equal to face value of them excepting J , K , Q and 10 which have been given a value of zero. The value of ace is one. 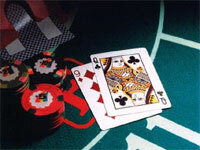 Players are allowed bet on the better hand , which may be player or may be banker. If you have placed your bet on hand of player and you win , you are given double the amount that you had bet. If you win against banker , you will again be getting a win equal to double your bet though there will be a deduction of 5 percent commission. Baccarat is a pure game of chance. Casino edge can not be decreased by players thorough any systems or decisions made by them. There is an exception in case of bet on tie. In that case advantage of casinos is 14 percent on a tie of 9 to 1. If there is a tie of 8 to 1 in a casino , the edge of casino will be even higher. When you are playing against banker , casino gets 5 percent of your wins with a very low 1.17 percent casino advantage whereas it is 1.36 percent in case of bets by players. Baccarat strategies have been notoriously failing and they have never succeeded . Their only purpose is making profit through selling them. Some of the baccarat strategies are described below , though we doubt their effectiveness. Martingale system is one such betting strategy. This means that you double your bets whenever you lose a bet. Once you win a bet , you will bet getting profit equal to initial betting. This strategy will only be working in casinos and games that are not having any betting limits and the resources at the disposal of players are unlimited. This kind of game is non existent and still has not been invented. Pattern Spotting: This baccarat strategy involves trying to find out patterns and then bet drawing knowledge from these patterns that were spotted. Casinos try their best to avoid any pattern watching strategies. They even are handing small paper grids sheets to players for allowing them to mark their hands and make their very own strategy. The patterns are being recorded in case of casinos that are online. In this Baccarat strategy, you try to play as less decks as you can. As per this strategy, you try to find the tables that are having the least decks. This strategy holds that fewer ducks go to advantage of the player. Though in our opinion it is a myth like other myths. Fewer tables mean more house edge.